Regulatory Careers Live is the only one-day careers fair in Europe dedicated to regulatory affairs. Our careers fair is for anyone who is starting or looking to further their career in healthcare regulatory affairs no matter where they are in the profession. It is an opportunity to meet with potential future employers and get essential advice from some of the most respected and influential leaders in the field of regulatory affairs. 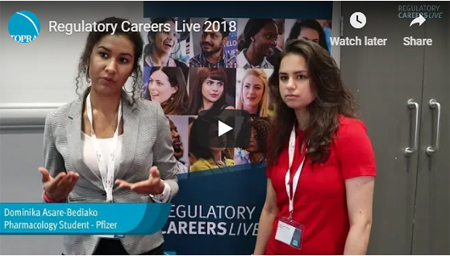 Regulatory Careers Live is aimed at professionals who have just started or are considering a career in healthcare regulatory affairs as well as life science students and recent graduates. It is the ideal opportunity to find out from experienced regulatory professionals from a wide range of backgrounds how you can develop your healthcare regulatory career, to learn about their career experiences and to gather essential tips in the recruitment process. Students and recent graduates. Join us on this day, if you are currently studying for a life science degree or if you have already obtained one and want to know how to successfully move into regulatory affairs. The exhibition is open all day. The event is free for TOPRA (student) members. It is also free for non-members if they book before 1 April. Students and recent graduates who aren’t members, can sign up for student membership, which allows them to attend the event for free. The University of Hertfordshire's de Havilland Campus is approximately 50 minutes to 1 hour north of London. There are fast and frequent trains from London’s King’s Cross to Hatfield (Herts) rail station or other routes from central London to St Albans City rail station. Directions can be found using the National Rail Journey Planner. From either rail station, buses run regulatory to the stops adjacent to the UH de Havilland Campus.